Be the first to share your favorite memory, photo or story of Antionette. This memorial page is dedicated for family, friends and future generations to celebrate the life of their loved one. 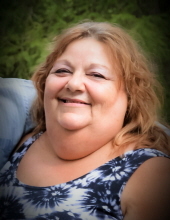 Antoinette M. “Toni” Petitti, age 63, of Antioch, passed away Sunday, November 11, 2018 at Advocate Condell Medical Center in Libertyville. She was born June 30, 1955, in Chicago, one of seven children, to Joseph and Barbara (Brost) Petitti. Toni enjoyed cooking but her passion was plants, especially cacti. She was a loving mom and doting grandma. Toni was a loving, thoughtful, and selfless person. Someone you could always depend on at any time. She was the catalyst of the family and very instrumental in making sure everyone was together for all gatherings. She will be greatly missed by all. Toni is survived by her son, Joseph (Alicia Heinrich) Giaimo; a grandson, Elijah Giaimo; siblings, William (Amy) Petitti, Barbara Kopke, Thomas Petitti, Jerry Petitti, Susan (Russ) Ogawa; former husband and dear friend, Mark Giaimo; and her faithful companion, Max. She was preceded in death by her parents; and a brother, John Petitti. Visitation will be on Saturday, November 17, 2018 from 1:30 p.m. until the 4:30 p.m. Memorial Service at Thompson Spring Grove Funeral Home, 8103 Wilmot Road, Spring Grove, IL 60081. For information please call the funeral home at 815-675-0550. To send flowers or a remembrance gift to the family of Antionette M. "Toni" Petitti, please visit our Tribute Store. "Email Address" would like to share the life celebration of Antionette M. "Toni" Petitti. Click on the "link" to go to share a favorite memory or leave a condolence message for the family.